This is an open invitation to all Hatch family, near and far, to share their family memories online. 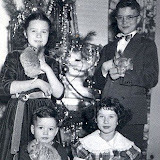 I have uploaded about 200 old family photos in the web album shown below. Please take a moment to add details and any memories you might have about these pictures to the comment section beneath each photo. I hope to add more family history photos in the future. Thanks in advance for participating in this! And please, feel free to share this link with all of the "cousins" you know! someone needs to gather the hatch family stories. I know dan has a hatchweb site. did someone write about your grand parents Marian and Frank Cottam Hatch? I just sent you some photos. Glad to see some interest in genealogy developing...the Hatches and Cottams were early Mormon settlers. MAny interesting stories can be gathered about them.